Although I'm an adult and don't eat cereal all that much anymore, I still absolutely love it and have only good memories associated with it. Growing up in the '80s and '90s, cereal culture was at an all-time high, and I think it has to do with the fact that no one knew anything about nutrition, for the most part. 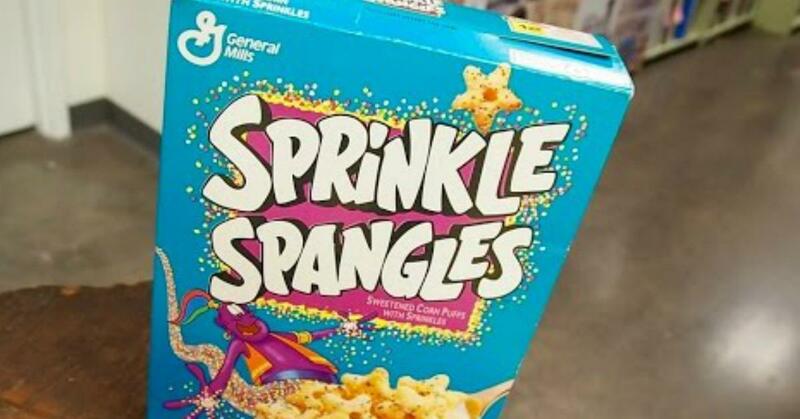 Sugary, glittery, sprinkly, marshmallowy, chocolatey bombs of deliciousness were packed into boxes and sold as viable breakfast options, and parents actually bought it. 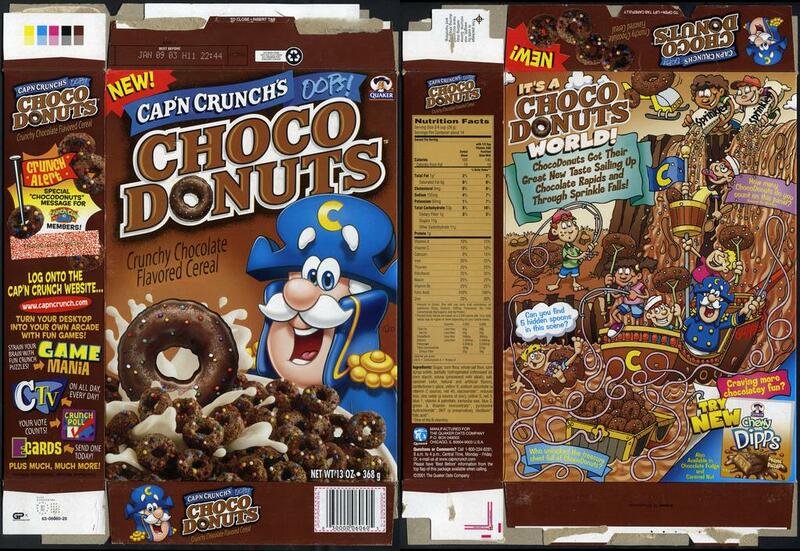 If you're like me, there's probably a lot of cereals you consumed as a child that you would never eat today. And, it turns out, you can't — because most of them no longer exist. 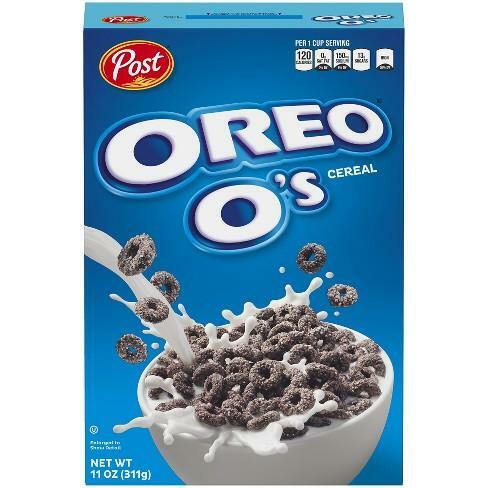 Here are 21 discontinued cereals from your childhood (and some even older)... thought a few have been recently returned to grocers' shelves. It didn't just come in a yellow box: Banana Frosted Flakes packed pieces of banana, but failed to hit the sales margin of its sister cereal. 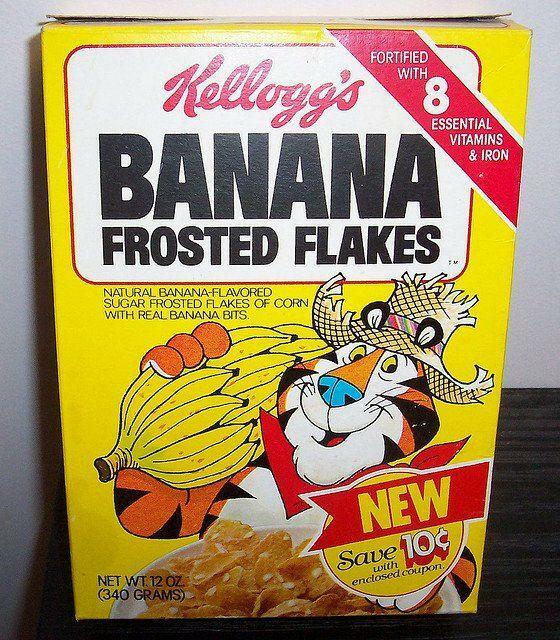 Sugar Frosted Flakes went on to become Frosted Flakes and this banana treat went the way of King Vitamin. One of Keanu Reeves' best movies was turned into a cartoon (no, not John Wick, although that'd be awesome) and subsequently a cereal, because what better way to spend your Saturday morning than to eat the characters you're watching on TV? Notice how you could enter to win a phone booth. 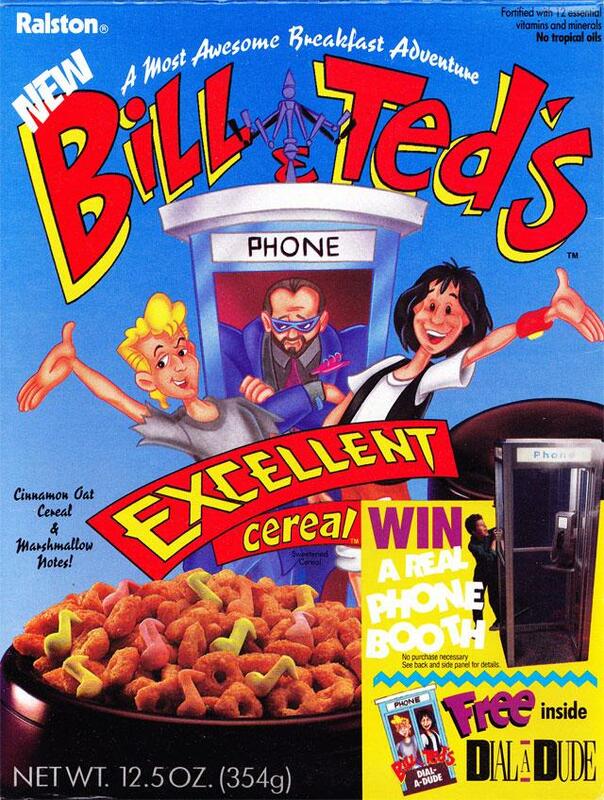 Now, adult me is befuddled by that prize, but I know childhood me absolutely needed a phone booth at all costs. Cap'n Crunch lives up to his name: that military man knows how to keep cereal from going soft even after sitting in milk for a few minutes. Choco Donuts was part of the "Oops!" brand of cereals, a marketing gimmick where the factory "accidentally" made the wrong kind of cereal, then accidentally printed boxes for it and mistakenly created commercials alerting the world to their gross incompetence as a food manufacturer. Oops! All Bloody Band-Aids would be a more convincing, albeit exponentially more disgusting, breakfast "accident." 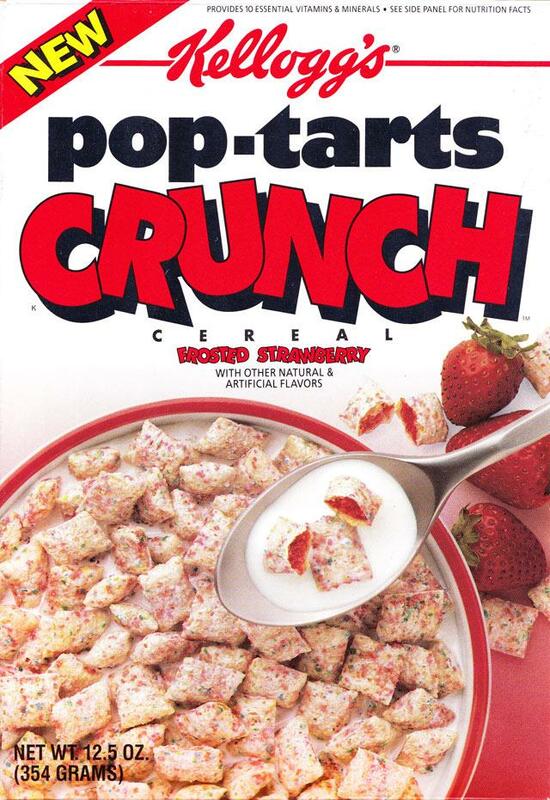 The '90s did this thing where they just took the unhealthiest foods ever and then tried to make them, "OK" to eat by transforming them into breakfast cereals. 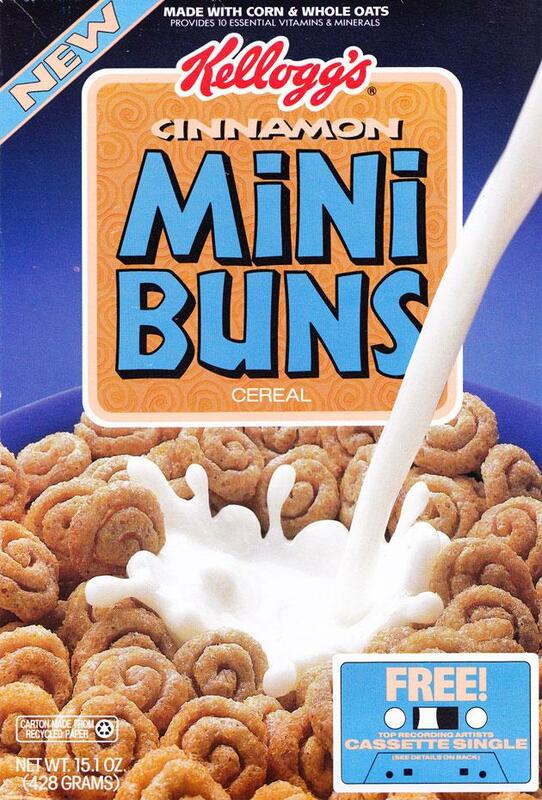 We all know Cinnabons are a one-way ticket to diabetesville, but if you want to hop on the express train, scarf down a big bowl of these in the morning before nabbing one on your way back home from work. Doesn't change the fact that they're delicious, though. 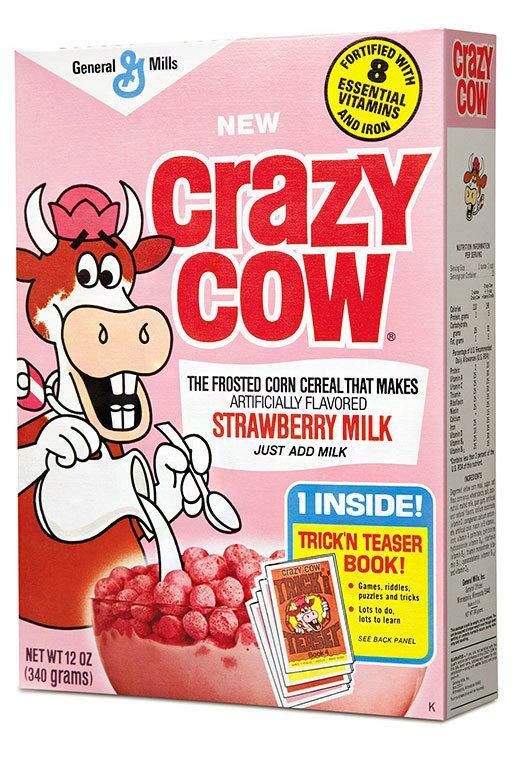 The '70s had this weird obsession with subtly horrifying box art on their cereal boxes, and no cereal greater exemplifies this theme than Crazy Cow. His vacant stare and blood-soaked puffs promise a delicious breakfast cereal that flavors your milk either chocolate or strawberry, depending on the box you bought. You could get these bad boys in glazed or chocolate — they're basically mini crunchy, sugar-sweetened donuts made out of corn. 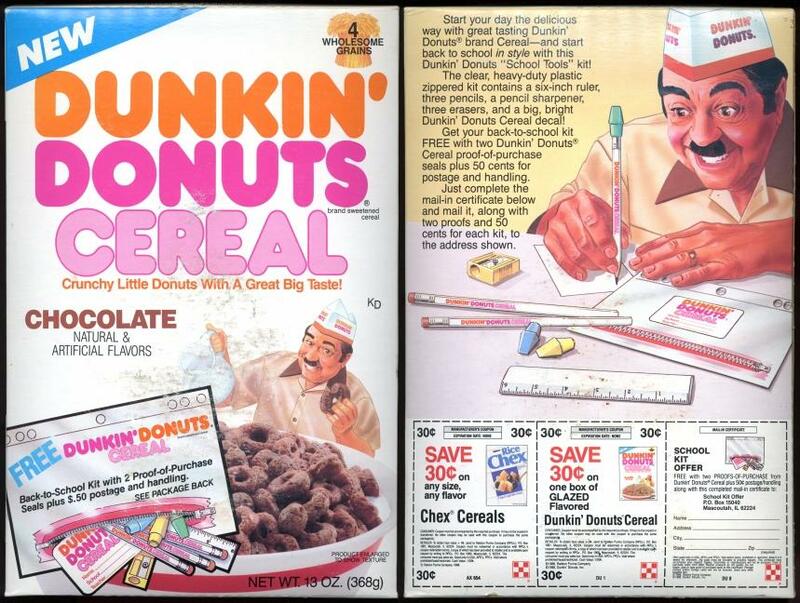 That school kit offering on the back of the box certainly looks sweet, but that illustration of the "Time to Make the Donuts" guy is slightly horrifying. Who writes with their pencil standing straight up? We all know Cinnamon Toast Crunch is the greatest cereal ever made, right? 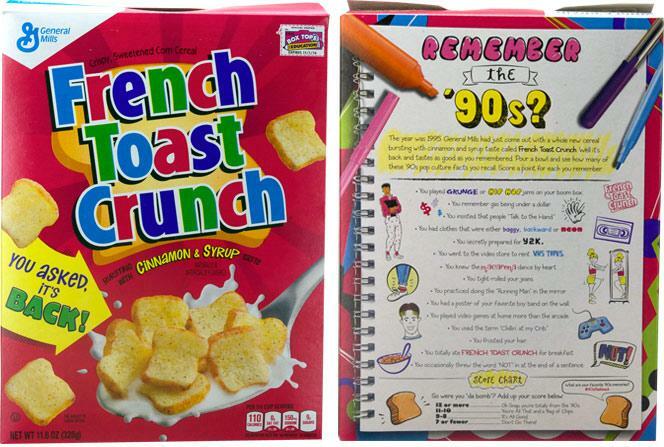 But General Mills took that breakfast-food-turned-into-cereal formula and gave it a maple syrup spin with this red-boxed bad boy: French Toast Crunch. I'm not going to lie, there was a point in time where I preferred these over CTC. Blasphemy, I know. This one you actually can revisit, though. After discontinuing it in the U.S. in 2006, GM brought it back in 2014 due to popular demand. 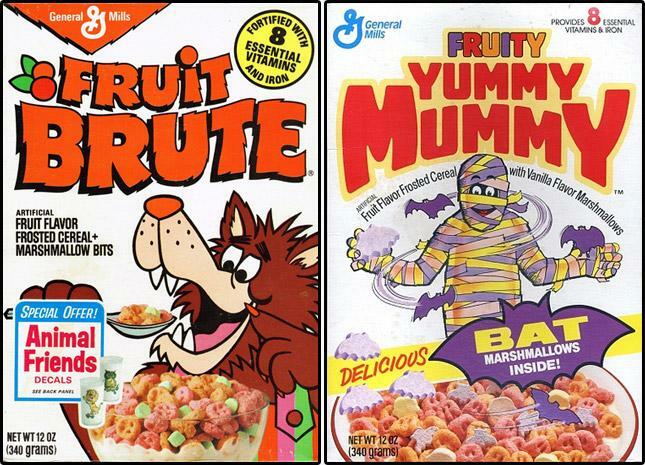 They're basically the same cereal, just re-branded with different monsters on the cover. They belong to the "Monster" line of cereals along with Count Chocula, Franken-Berry, and Boo-Berry. They had a limited re-release a few Halloweens ago. 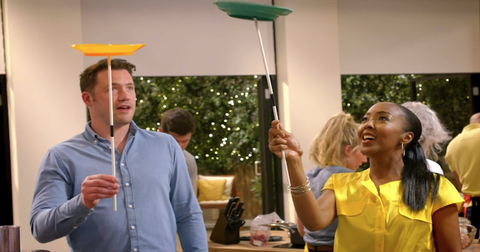 Fun fact: Yummy Mummies is now a British reality TV show and I'm sure there's a Pride parade with a bear in it that calls himself "The Fruit Brute." I mean, I should know, because I was him. 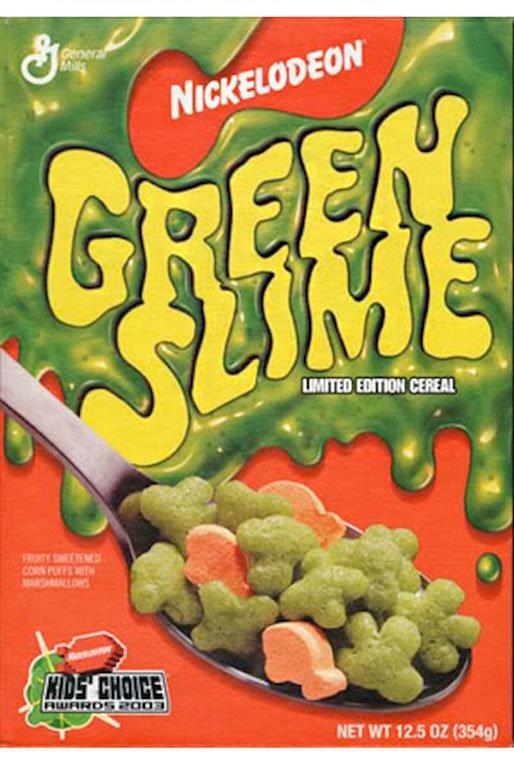 This food was used to help promote the 2003 Kids Choice Awards, and people on Mr. Breakfast are saying, despite its obvious corporate shilling, it was still a tasty cereal. It also kinda turned your tongue green, so that's a plus. 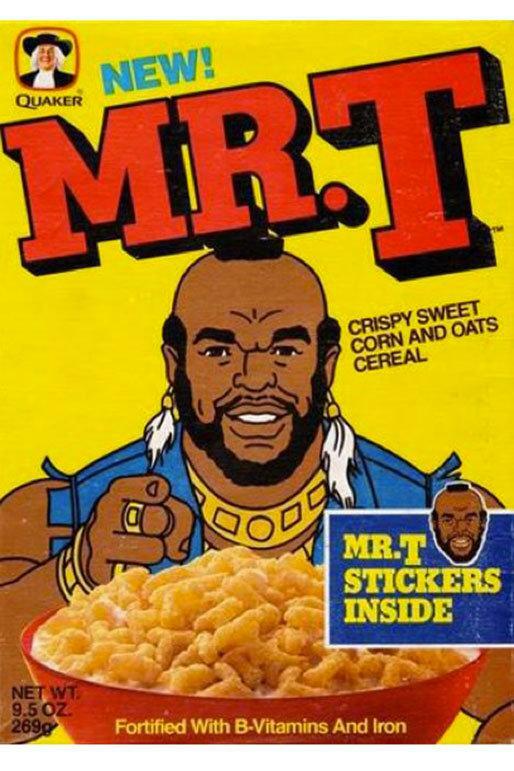 Mr. T's cereal was famously featured in Tim Burton's greatest film to date, Pee Wee's Big Adventure. It was discontinued by the time I first saw the movie as a kid, but that didn't mean I'd hopefully trounce through the cereal aisle every time I'd go with my mom, hoping it'd be there on the shelf. Overly-sweet candy turned into cereal that's meant to be eaten with milk sounds like a terrible idea, and consumers probably thought so too — the cereal was ultimately discontinued. However, the Nerds philosophy was kept intact and each box came with two separate bags rocking a different flavors, you gotta respect that level of commitment to a brand identity. So good, they had to bring them back. These were seriously good. Criminally good. Like, a box wouldn't even last a day in the house good. There's no way on God's green earth that the cereal in this box, however, could ever, ever, last a day in a multi-sibling household. Or be considered part of a healthy, balanced breakfast. Another cereal that was brought back recently exclusively to Walmart, the folks at Kellogg's thought it'd be a good idea to help people who loved eating Pop-Tarts but couldn't stop burning the roofs of their mouths with scalding hot jelly filling. It comes in Strawberry and Brown Sugar flavors. Another cereal that was created to capitalize on the success of a Hallmark card character-turned-cartoon, this colorful-jam just screams the '80s. 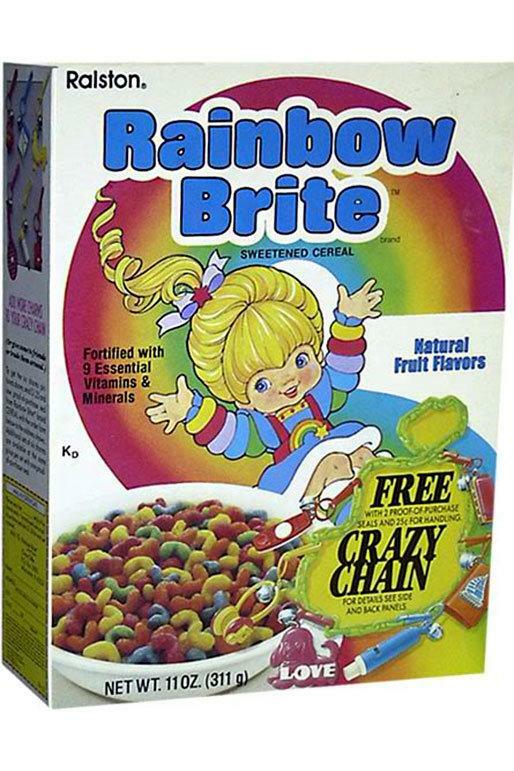 I still kinda want that crazy chain on the box, though. 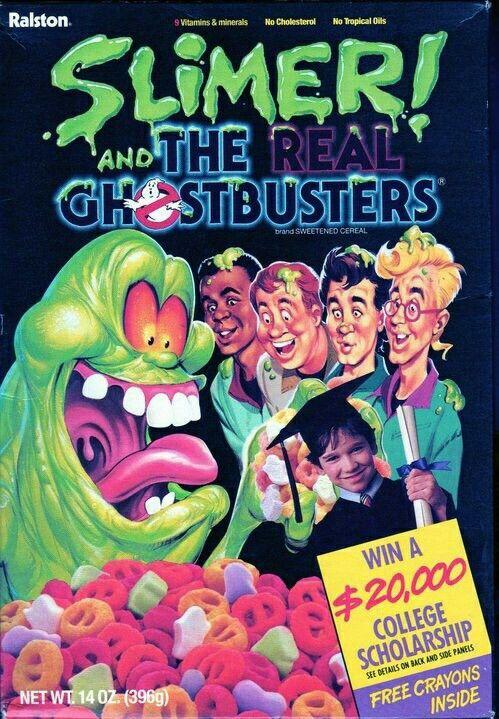 It seems like Ralston's thing was taking cartoons and turning them into breakfast cereals, and the Ghostbusters cereal is another business venture of theirs that tried to make big bucks off of some Ghostbusters love. This box came with a kinda whack free toy, but the chance to win a $20k College Scholarship is smart. 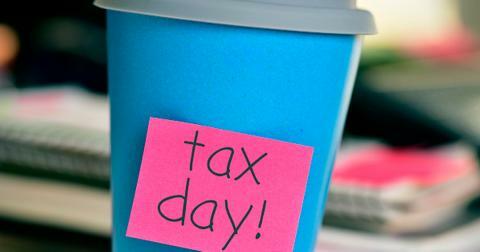 Imagine how many parents picked up a box of this stuff for that alone? So yes, the theme song to Rugrats is maddening and the babies all look like they're made out of mashed potatoes and if you watch too many episodes in a row you start to get a painful headache, but there's no doubt that this show ruled the '90s and every kid, even if they didn't like it that much, would probably watch it if it was on. Plus, it's got a dinosaur on the box, Reptar rules. You love Rice Krispies. You love turning them into little marshmallow-infused treats. 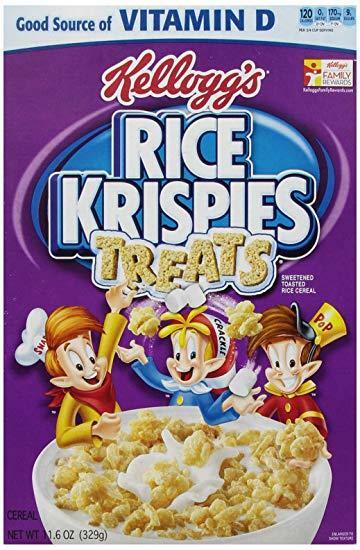 So some genius over at Kellogg's was like, "Ey yo let's just cut the middle man on this whole Rice Krispies treats business and just turn it into a cereal already?" People loved the idea, and if you were a fan of this purple-boxed delight, its discontinuation was a sad, sad day in your life. Good news though is that they're back! 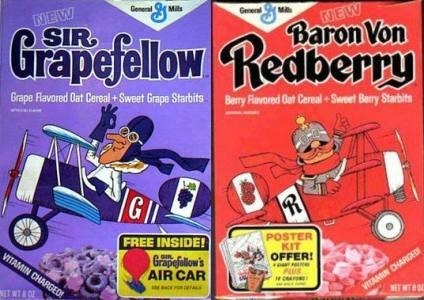 Grape-flavored cereal sounds super nasty, so slapping a pilot on the box and giving him a Strawberry-themed aerial rival by the name of Baron Von Redberry is a good way to get people to forget you're eating artificially-sweetened grape-flavored puffs. Someone over at GM thought it'd be a good idea to rip off Disney's Genie from Aladdin and use the likeness to sell some cereal with sprinkles on it — and they were right. This sugary delight would probably never make shelves today, but if you were lucky enough to get a box of these as a kid, you were basically eating candy for breakfast. Fun fact: when I was a kid and Family Matters would come on, I once got in a passionate discourse with my cousin Nora, where the two of us agreed that it was absolutely ridiculous for the network to call the show Family Matters when we clearly only watched it for Urkel. 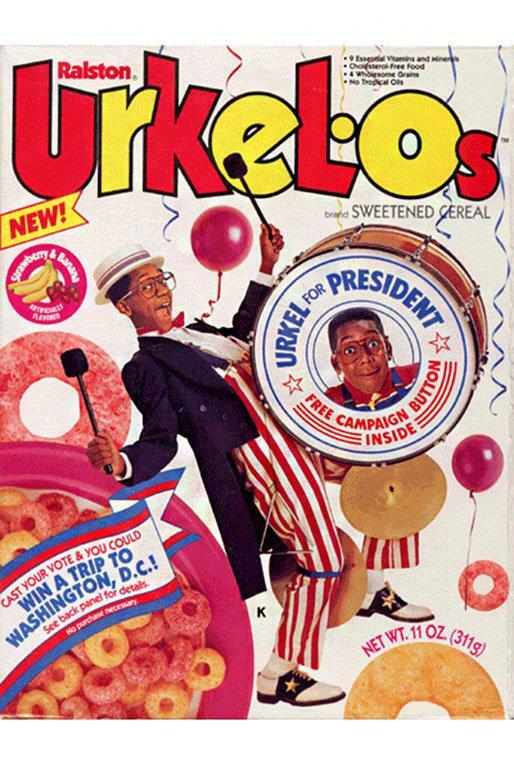 So why not just call it Urkel? No one's trying to eat "Eddie Winslow Flakes" or "Estelle Puffs." These strawberry and banana fruit rings were short-lived, probably due to the reported weird and artificial flavor they were packing. 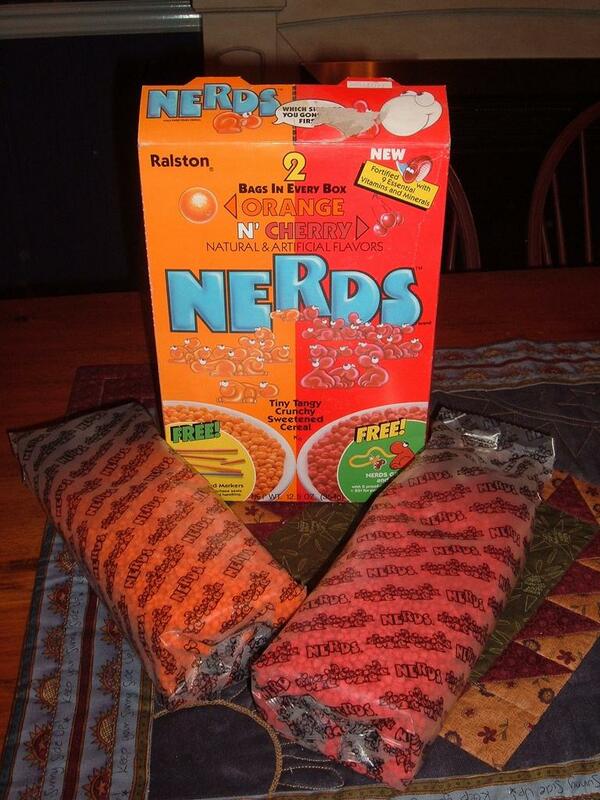 These most famously came packed with plastic Ninja Turtles cereal bowls. They were wrapped in plastic on the outside of the box and I remember running around looking for a Michaelangelo one before my mother finally acquiesced and picked it up off the shelf for me. 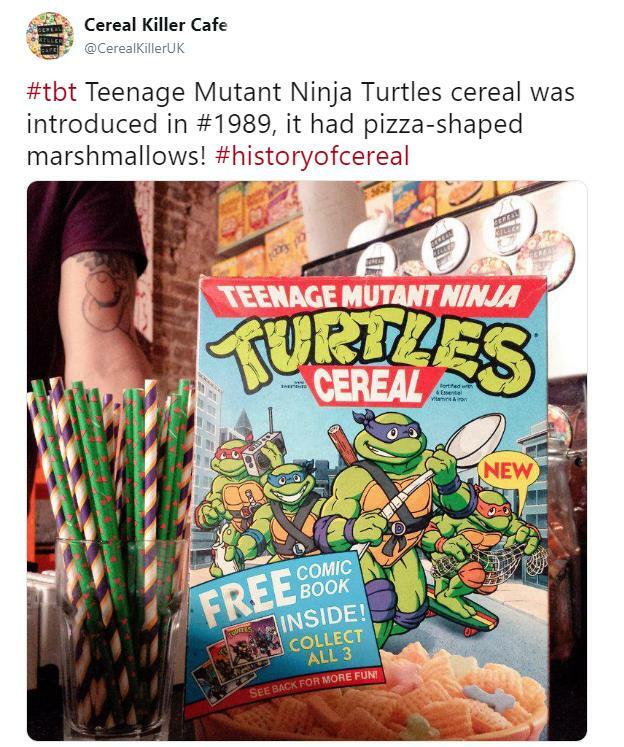 The "ninja net" cereal pieces were just re-branded Chex squares, and it also packed marshmallows shaped like pizzas and the various weapons like throwing stars and swords. It's not cereal, it's a system. 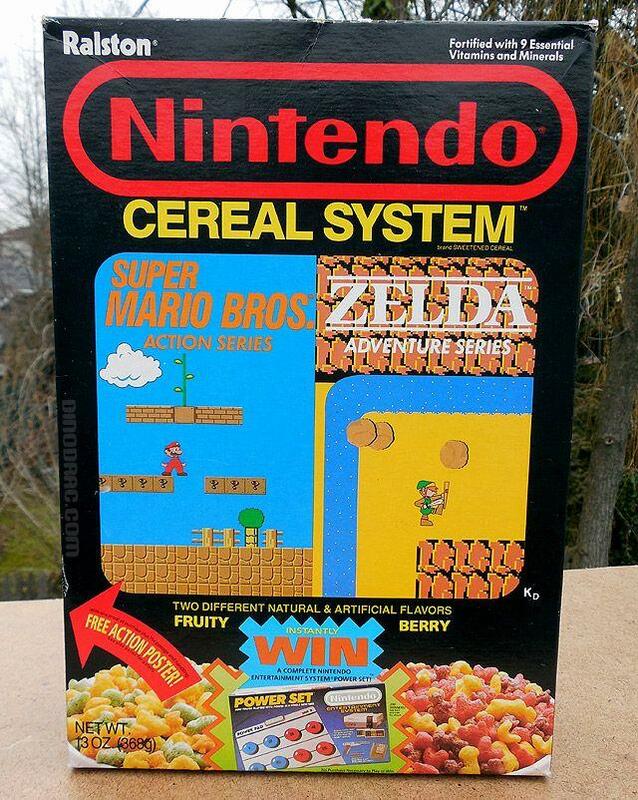 Like the Nerds box on this list, the Nintendo cereal came with two bags: Mario and Legend of Zelda. They were "fruity" and "berry" flavored cereals. Fans who remember the flavor said that it was nothing to write home about, but that the Mario flavor was the better of the two. I remember eating what had to be an expired or soon-to-be-expired box when I was around four years old that my father bought at our local Peddler's Mart in New City, NY. I loved the Mario flavor, but only because I loved Super Mario Bros.